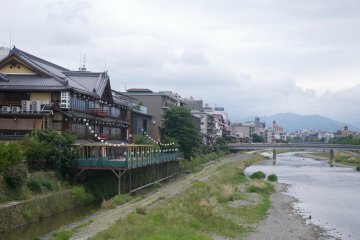 The bank near the Gojo and Shijo areas of Kyoto. 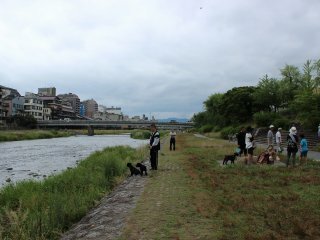 You can see many locals enjoying a stroll along the river bank. 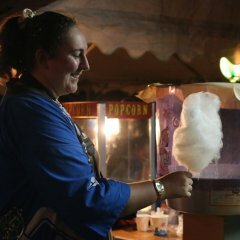 The embankment is crowded with chatting students, people practicing instruments, and couples. In summer, the shops offer terrace seating here as well. 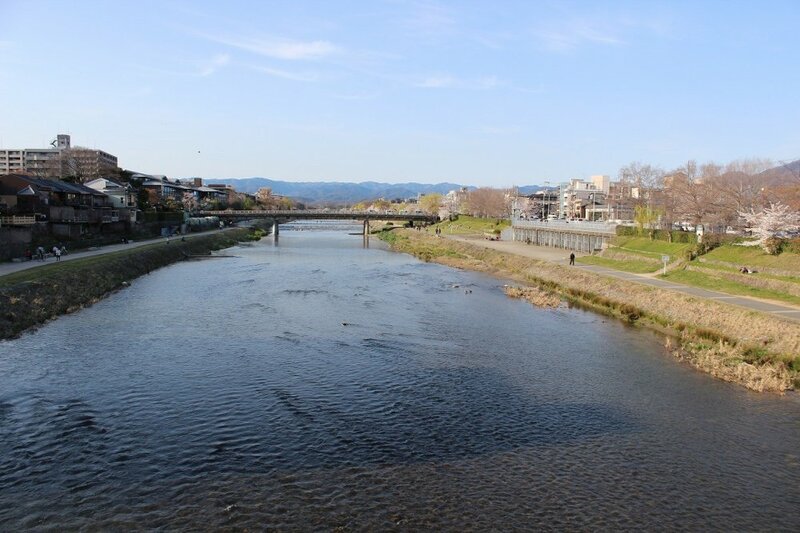 The Kamogawa river turns into the Takanogawa and secondary Kamogawa river at the spot called Demachiyanagi. 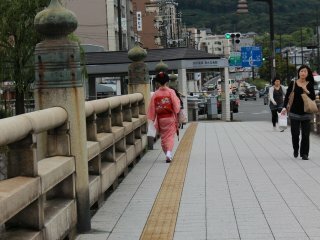 Near that junction is Shimogawa Temple. 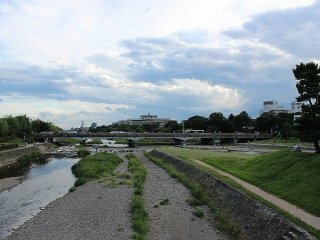 Looking south down the Kamogawa river from the Shijo area, couples can be seen spaced out along the river bank. 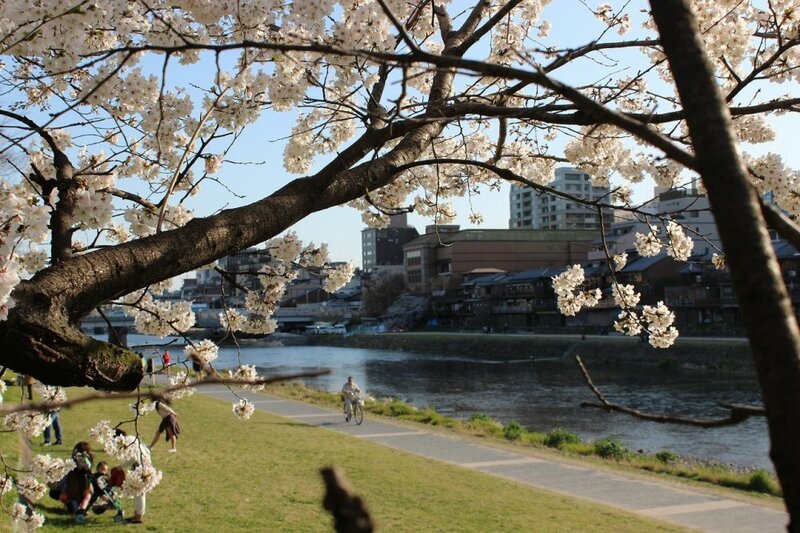 Kamogawa River flows north to south through downtown Kyoto, and is a great spot to experience the four seasons of the city with its flowers, views of the riverbed, and even its autumn leaves. 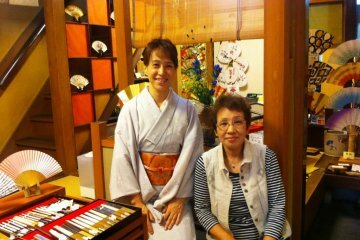 It's a popular place for locals, couples, and even tourists to wander along, once they are tired of the city's various temples. 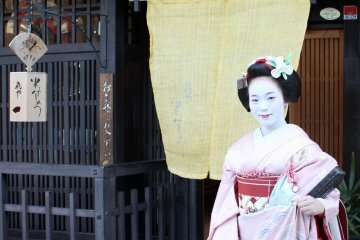 If you are lucky, sometimes you can even spot a maiko or geisha, traditional Japanese entertainers, along the river banks. Of course, it isn't as exciting to visit the riverbank in winter, when the cold winds can feel piercing. However, on sunny, gentle days, even in winter, the east and west banks of the river make a great place for a stroll. 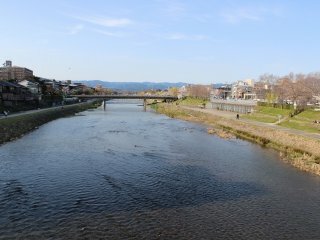 While a trip to the river bank makes for a lovely day trip now, according to stories of ancient Kyoto, the city's infirm were often left to die along the banks of this same river. 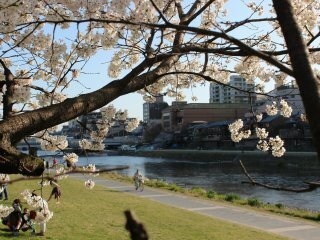 That history, however, as we look upon the dazzling, shining silver surface of the Kamogawa River, seems very far away now. "The flowing river is always changing, and the same water never flows by twice". 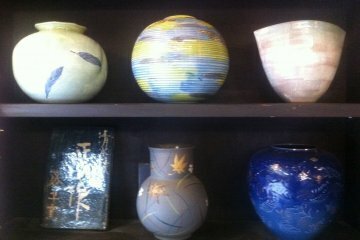 This sentiment can be felt strongly as you gaze at the flowing waters of the Kamogawa River. 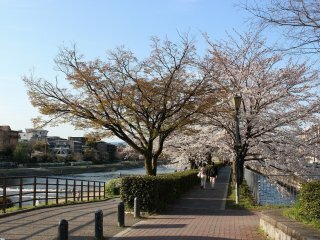 The banks of the Kamogawa River are approximately a ten-minute walk east from JR Kyoto Station, or can be reached from Shijo or Gojo stations on the Karasuma subway line.